Some have called Deathgasm the party movie of 2015. When we release our Top 10 movies of the year, it will surely find it's why to the top of my list. There is no doubt about that. If you haven't seen this gory ode to black metal and the early works of Peter Jackson, you are missing out on one of the funnest rock and roll inspired horror shows of all time. It's an electrified punch to the gut that never once hesitates to rip out your insides and leave them splattered all over the floor. That's why we're so happy to announce that the sequel, which is promised at the end of Deathgasm, is closer to becoming a reality! Deathgasm was written by Jason Lei Howden, and it's drenched in blood from start to finish. So it's hard to imagine how the first time filmmaker plans to take that to the next level with his second big screen effort. But that's exactly what he is planning to do. He has confirmed that he finished the script for the sequel, which is titled Deathgasm Part 2: Goremageddon. And he teased the following on his Instagram page. "So I just finished this. There is literally more gore in the first 10 minutes than the entire first #deathgasm. If you kinda liked the first, this will make your head implode. If you thought the first 'Deathgasm' was puerile, juvenile and dumb then 'Goremageddon' will melt your face off and force you to barricade yourself inside, safe with some Terrance Malik and Coldplay." Sounds great! Sign us up. Deathgasm is one of the rare movies that totally delivers on its premise. So it's going to be fun to see if Jason Lei Howden is able to live up to his own hype. The original has not yet found its following, but in the next year, we're sure it will. Right now, you might be looking at this story, thinking, 'Whatever.' But when Deathgasm blasts its way to Digital Download, Blu-ray and DVD early in the New Year, we're sure we're going to start hearing a whole lot of people singing its praises. 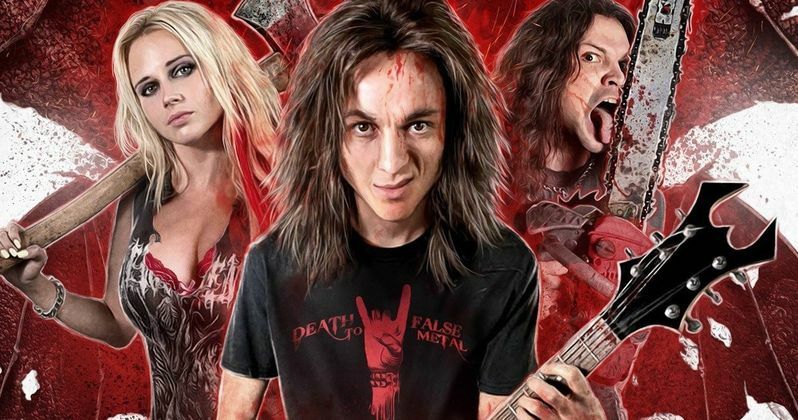 The original Deathgasm introduces a stellar cast of newcomers including Milo Cawthorne, James Blake and Kimberley Crossman. The story follows Metal-thrashing Brodie, an outcast in a sea of jocks and cheerleaders in a suburban wasteland. Until he meets a kindred spirit in fellow metalhead Zakk. After starting their own band, Brodie and Zakk come upon a mysterious piece of sheet music said to grant ultimate power to whoever plays it. But the music also summons an ancient evil entity known as Aeloth The Blind One, which threatens to tear apart existence itself. The boys' classmates and family become inhabited by demonic forces, tearing out their own eyes and turning into psychotic murderers...And that's only the beginning! It's up to Brodie, Zakk and their group of friends to stop a force of pure evil from devouring all of mankind. We've included the two previously released trailers for Deathgasm. Do yourself a favor. Seek this one out. As soon as you do, you'll be just as pumped as we are for the sequel!